Using Chrome? One of the greatest features of Google’s nimble, speedy browser is the sheer volume of free extensions available from the Chrome store. These extensions are essentially software add-ons that enhance the browser’s performance, tacking on extra capabilities to what you can do within its confines. Forget opening up another browser tab or whole other program – these useful extensions not only protect your privacy and security, but they also make surfing the web and working online easier and more efficient. This does exactly what you'd think – Grammarly fixes your grammar. When you download the Chrome extension, the handy little word nerd automatically scans anything you type into a browser text field, be it an email window or online form. It will flag spelling, syntax and other grammar mistakes and offer corrections that you can either accept or dismiss – in case the passive voice was in fact what you intended. If you’re one of the millions of Microsoft Office users out there, the Office Online extension for Chrome provides quick access to your Office documents, spreadsheets and presentations. Click on the Office Online icon and a drop-down menu displays files recently saved to OneDrive, along with handy tiles linking to PowerPoint, Word, Excel, OneNote et al. This allows you to instantly open files you’ve been working on, without having to fire up the Office program if most of your work is being done by browser – for instance, if you’re emailing or researching. If you have more than one Office account – say, your personal Outlook email and your work or school account – you can use both (or all) with the extension. If you ever need to send a screenshot, whether it's proof of work to your manager or hilarious animal videos to your best friend, this extension makes it an incredibly fast, easy process. You can capture full-screen shots as well as record video of any animated webpage (the first 30 seconds are free; for longer, you’ll have to subscribe). You can also capture sections of a screen or shots that span the entire length of a webpage (it will scroll for you). Editing features include crop, resize, blur and other effects, as well as the ability to annotate shots with text or arrows. The extension also supports editing for uploaded images. Do you know how you spend your time online? 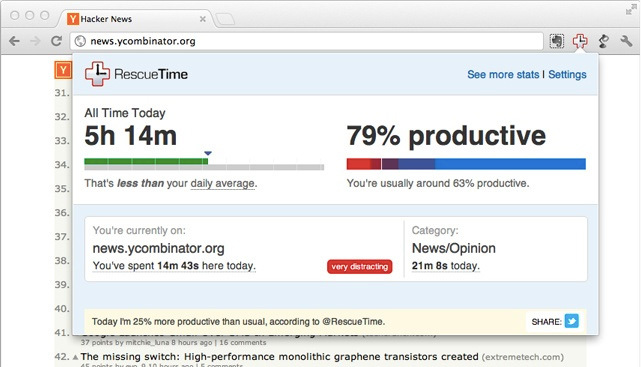 The RescueTime time-tracking extension monitors the minutes you spend on every website and categorizes each with productivity grades ranging from productive to very distracting. You’ll get a weekly email breakdown of how you spend your days, and if you decide to sign up for a premium subscription, you’ll be able to block distracting websites and turn on offline tracking to monitor how much time you spend – or waste – on phone calls, meetings and other non-computer tasks. Having a ton of open browser tabs is one way to slow down your browser – and your computer. If you tend to rack up those tabs as you bounce deep into the rabbit hole that is the internet, this extension will help to manage your tabs, by saving those crucial links to open later. This can not only free up RAM and contribute to faster browser performance, but also reduce clutter, both mental and browser-based. 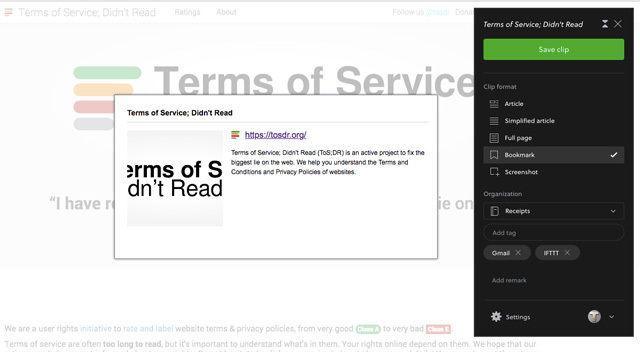 Saved tabs can be organized by topic and the links exported to email, documents and online posts. Whatever research you’re doing online, this extension lets you save it to a virtual notebook on Evernote, the excellent note-taking and organizational app. Once installed in your browser, the Evernote toolbar icon can be clicked on any webpage to save it in a variety of forms – as it is, in a text-only version, as a bookmarked link, or as a screenshot, which can be dragged to select particular sections. Pages can be saved to existing Evernote notebooks, or to a fresh one, newly created within the extension’s drop-down menu. Options for adding tags and remarks help with categorization. 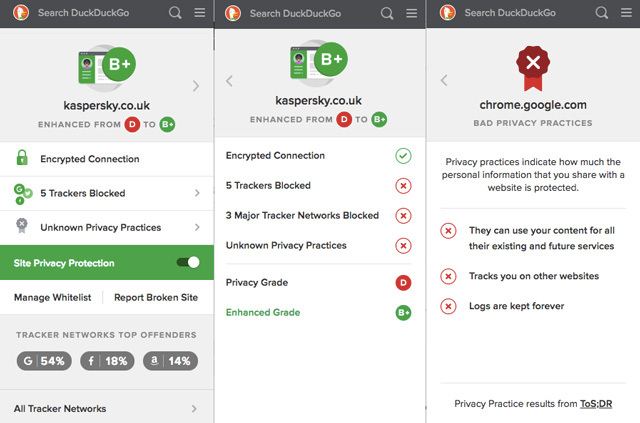 Installing this extension of the anonymous search engine DuckDuckGo implements an anti-tracker that will block any tracking cookies on sites you visit, along with grading these sites on their general privacy based on known practices, number of trackers, and whether sites use an encrypted connection. At a site graded a poor D? Fret not, these usually get bumped up to an “enhanced grade” of B or better, thanks to the tracker blocking. The extension also makes DuckDuckGo your default search, instead of Google. One of the basic rules of safe web browsing is to check that the websites you visit have URLs beginning with HTTPS (instead of HTTP). This indicates that traffic between your browser and the site is encrypted, and therefore has a modicum of protection against hackers or snoops who may be spying on that traffic. Unfortunately, not all sites have HTTPS encryption activated – but this handy extension from pro-privacy non-profit Electronic Frontier Foundation activates it on those sites. Note, however, that this only works for sites (and site elements like widgets) that support HTTPS; you can either enable a setting to ‘Block HTTP requests’ to block any non-HTTPS element or site, or check the URL to avoid HTTP pages if they’re asking for sensitive information like logins or credit card details. At any given site, dozens or even hundreds of trackers from advertising networks are logging your clicks, to track the site you came from, your activity on-site and where you go when you leave the site. 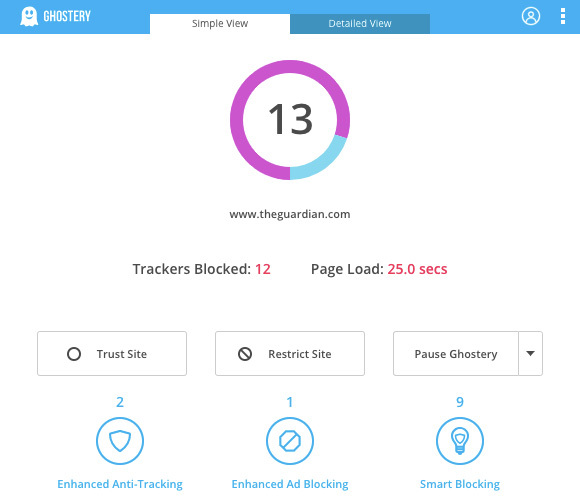 The Ghostery Chrome extension can block those trackers, while keeping active those trackers necessary for optimum page performance (such as those which track how a website’s features are used, or which save shopping carts). A built-in ad blocker additionally prevents advertisements from showing – though you can whitelist your favorite sites, since ads likely form part of their business model. A fascinating dashboard displays just how many trackers are no longer following your every move. 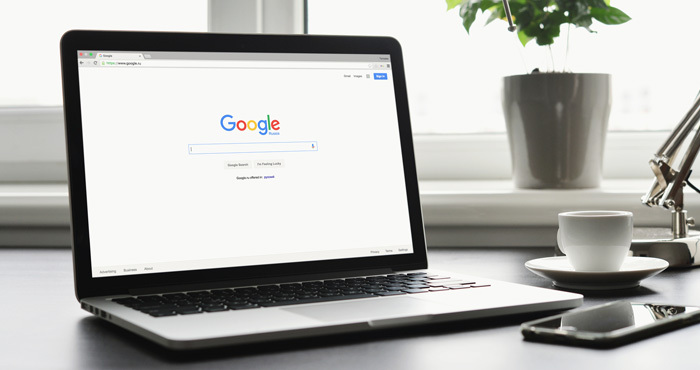 Though we’ve recommended some of the Chrome extensions we find most useful, you probably don’t want to download every single one of them. Not only can that significantly slow down page loading, as each extension may have access to every webpage, but a glut of browser extensions can impact security. This is because browser extensions – depending on the features they offer – usually require permission to “read” all your traffic, and in some cases alter your data (for example, Grammarly needs that permission in order to fix your word woes). Each browser extension, therefore, presents an additional area where hackers could attack in order to access your web traffic – and the more extensions, the more potential vulnerabilities. Periodically, it’s a good idea to head into the Chrome settings and double-check which extensions you’re using. For any that you haven’t made use of in a while, remove them to reduce the possibility for hacking or data scraping, or disable them to help your browser run that bit faster. Just tap the top-right arrow in the Chrome toolbar and select More Tools > Extensions to review what you have installed. Extensions can improve the efficiency of how you work online – just be sure to cherry-pick the ones you really need. In installed 4 of these and definitely powered up my browser. I really like the Mercury Reader to view articles without ads. I case of the screenshot I use Lightshot. This is a pretty useful app according to me. I use another chrome extension for writing is Grammarly. I find Grammarly is the most useful app online. It really helps your writing better.